When using the USB copy button on front of the MyCloud to backup the data from the USB drive on the network drive, the data is stored in the location that is set here. By default, the data is stored in the public directory. USB Copy Folder The path where the data is stored when using the USB copy function. Browse To set a different path, click Browse, locate the folder on your network drive and click Open to select the new folder. 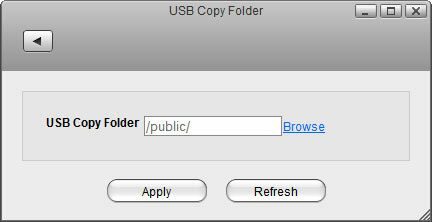 The USB copy button is only available for certain MyCloud models (e.g. MyCloud Duo, MyCloud Pro), so this setting might not apply to your device.